Actually Soccer: Who are you, what do you do, where are you from and how’s your life related to Subbuteo? My name is Oliver, I work at a university here in Germany. I grew up in the Ruhrgebiet (born 1976 in the City of Essen) and have always been a football fan. But Subbuteo was not popular at all in my childhood. My friends and I played Tipp-Kick instead. You know Tipp-Kick? Two teams of only one miniature soccer players face off on a tabletop playing field. Each player has a little red knob on its head; tap it and the player kicks an octagonal, two-colored ball across a green-carpet playing field. Actually Soccer: What’s your first memory about Subbuteo? Many years later, in autumn 2015, I made up a plan to create a Tipp-Kick pitch on a wooden board. So I checked some YouTube channels to find a suitable tutorial. After clicking some videos, I stumbled upon a Subbuteo match and was thrilled immediately! 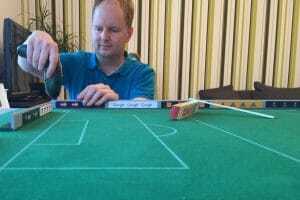 Subbuteo – what a beautiful game with strategical options. Fast, precise and best: with ten players and a goalie in each team. I couldn’t get away from my computer and watched more and more matches. I realized that there are lots of rules waiting to be learned for a beginner. But that’s what is so great about the internet: You’ll find helping forums, news articles, shops and trading places for all kinds of equipment. Actually Soccer: Are you a Subbuteo Collector? I am not really a collector. Well, I have bought some teams and equipment (referees, substitute benches, a trophy and merchandise like cups or T-shirts). But on the long run, I am a DIY creator and have made my own Subbuteo table and seven hand painted teams with decals so far. I think, if you bought a ready-to-go team to begin your next Subbuteo match, you’d miss half of the fun: Try to prepare your own team with decals and colors instead. Crafting is an important part of Subbuteo’s attraction. 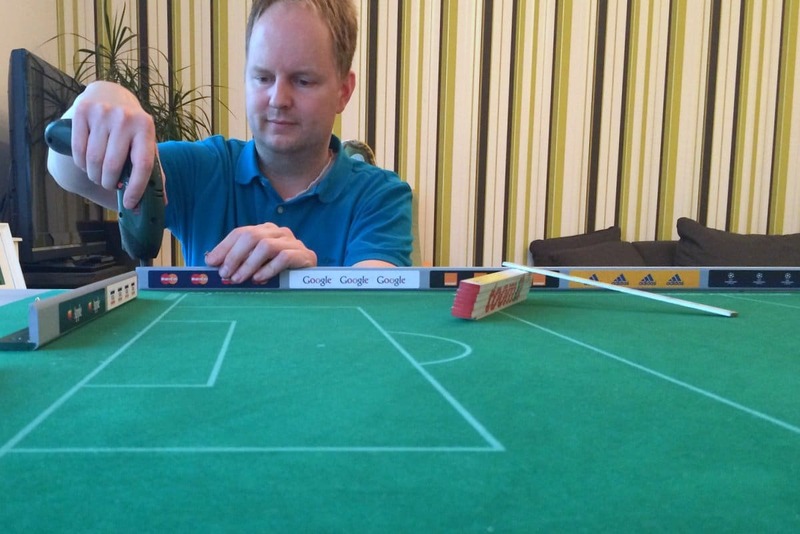 Actually Soccer: Tell us something about your Subbuteo life. I try to catch the latest Subbuteo news on the internet. I follow many people from the Subbuteo industry on Facebook and Instagram, I joined some interesting groups on Facebook and read and watch everything there is. In my little spare time I try to practice, most of he time alone or with family. And once in a while it itches in my fingers and I have to make a new team with decals. Actually Soccer: What’s your favourite team? I have a BVB team (Season 2014/15 in black away shirts) on Sniper 2.0 LW bases which I really like. Not only because I am a supporter of that club but because of the fine bases’ characteristics: good gliding, soft touch and control. This is an excerpt of the the 10-for-you interview featured on Actually Soccer. Read the complete article.